As he’s talking, the twisted, burnt remnants of what was once a school bus are dragged away. Haq leaves after answering my questions, and within an hour the other police, officials and TV crews have all departed too. It’s as if everything is back to normal. At Lady Reading Hospital, the largest in the province and the one forced to deal with more terrorism victims than any in the country, head of the emergency room Dr Shiraz Afridi receives the corpse of the young worker who has just died. ‘He was walking past the bus as the bomb exploded,’ Afridi says. A piece of shrapnel from the blast apparently entered the boy’s heart. It would have been a quick death, Afridi adds. Outside the hospital, police continue setting up checkpoints in the neighbouring Storyteller’s Market of the old city in preparation for the Ashura events that are to commence over the next three days. As I walk outside, mourners are preparing themselves for one of the first big processions in Peshawar Cantonment. On the loud speaker, the cleric at the local Imambargah wails as he describes in detail the murder of Imam Husayn and his family in the city of Karbala, in modern day Iraq. I notice Haq ordering his men to fan out across the wide boulevards that will shortly be filled with mourners. Bombs could literally be anywhere, he says—‘hidden under rubbish bins, in parked vehicles, even inside drains.’ I suddenly become a little paranoid as I notice I’m surrounded by rubbish bins and drains. Although today’s procession ends without any disturbance, that evening a girl is killed in a grenade attack outside a mosque in the old city of Peshawar. As I rush to the scene of the blast, police are already scattering across the narrow streets and lanes, pushing bystanders away from the area. I slip through the commotion to the spot where the grenade went off, now marked by a small crater surrounded by debris and faint splashes of blood. But again, just as with the earlier IED attack, there are signs that life is already returning to normal despite this latest disturbance. Haq and the police bomb squad leave almost as soon as they arrive, and the makeshift barbwire barricades set up by security forces while investigators inspected the scene are slowly being dismantled. The victims of this latest blast, I’m told, have been taken to hospital. This time, Lady Reading feels more chaotic. The parents of children injured in the latest blast pour into the emergency ward, crying out for someone to help. In the corner, the mother of the murdered girl screams uncontrollably, shaking her arms in distress. Doctors and medical staff swing calmly into action, despite the disturbances around them. They’ve apparently seen all of this before. 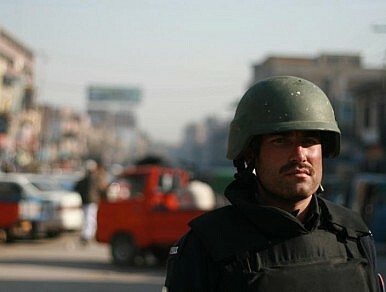 There’s a lockdown in Peshawar’s old city as Ashura commences. Narrow streets and dusty ancient bazaars that are normally brimming with the sights and sounds of a vibrant city are eerily quiet. The shops have all been shuttered. Police barricades have closed off every entry point into the old city, which is home to thousands of Shia Muslims. Processions continue from morning to night as Shia Muslims drift out of the old city’s Imambargahs and onto the otherwise empty streets. Along with the regular police, there are voluntary security guards manning makeshift checkpoints with metal detectors. Most are Shia, but many are not—including Malik, a Sunni Muslim who guards the entrance to the local Imambargah of a childhood friend. ‘We’re all brothers here,’ Malik says proudly, ‘We need to look out for one another.’ I walk past him inside the Imambargah, which is now crowded with worshippers, chanting hymns and dancing rhythmically while a few sing songs venerating the fallen Imam Husayn. The smell of incense fills the room. It’s an emotional and intense experience. ‘For us it is as though Imam Husayn died yesterday,’ one worshiper tells me as he passes around a bowl of sweets. This last comment is a view shared by Haq, who I meet for the last time as he rests in his barracks. It’s a Spartan room, lined with a few bare mattresses, blankets and personal belongings. As I greet him, the lights suddenly go off, a symptom of the routine power outages that have gripped Pakistan for some years now. ‘Thank Allah we had a peaceful Ashura this time, to him we are grateful,’ he says. I add that it probably also had something to do with the precautions taken by him and his men. He smiles and clasps my hand. It’s a humbling display of patriotism by a brave old police officer. And a reminder that while some claim to kill in God’s name in Pakistan, others see the task of protecting lives as God’s work. Mustafa Qadri is a freelance journalist based in Pakistan.